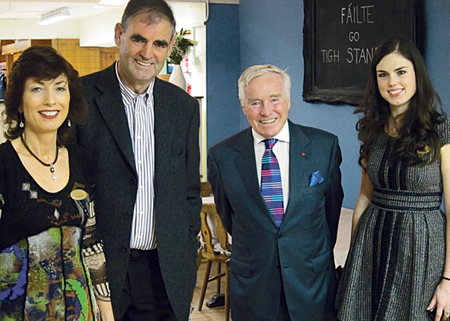 Raymonde and Donal Standún and their daughter Cliona, pictured with Feargal Quinn when he filmed the Retail Therapy show some time ago. Standún of Spiddal, which is to celebrate its 65th anniversary this month, is to feature in this weekend’s episode of RTÉ’s Feargal Quinn’s Retail Therapy. As one of Galway’s longest established department stores, Standún, has worked tirelessly over the years to constantly move with the times, to implement new ideas and approaches to business, while at the same time maintaining the same level of service and loyalty which made it such a success since it opened its doors in 1946. For the past couple of years the decline in tourism and the demand of the local customer necessitated a new image and a new buying strategy, changes which manager, Clíona Standún, passionately strove for after taking over the reins from her father Donal last year. The Standúns turned to Feargal Quinn to help 27-year-old Clíona forge a new modern identity for Standún that will attract both local shoppers and tourists. There have been many changes made since the Standún business first began with Máirtín and May who opened a small drapery and grocery store, eventually developing it into a supermarket and hardware store. Donal Standún, who took over from his parents in the seventies, also made changes getting rid of the supermarket element, and developed further the tourist and gift side of the business which his parents started by employing thousands of knitters to knit Aran sweaters, giving the shop the image most associated with it up to recently. When it was time for the third generation to take over it was inevitable that more changes would be needed in order to modernise and further grow the business. With Clíona firmly at the helm, the building in need of a face-lift and the introduction of international fashion and giftware it was time to bring in the big guns, in the form of Feargal Quinn, to give expert advice on how to implement the changes while at the same time maintaining and developing the tourist side of the business. In the episode of Feargal Quinn’s Retail Therapy which airs this Sunday at 8.30pm on RTÉ One, viewers will see many elements of the extensive filming which includes interviews with the Standún family - Donal, his wife Raymonde, and their daughter Clíona - on their hopes for the business as well as the eagle-eyed Mr Quinn being left to his own devices, to have a good look around the store and the business, giving his reaction and figuring out where changes can be made. What else will be shown in the upcoming episode remains to be seen but one thing is for sure, it was all hands on deck for the filming with Clíona, who is a BSc graduate in business information systems with experience in retail in Harvey Nichols and as a web consultant for l’Oréal in London, being given a number of tasks to complete. The tasks included gathering clothing that would best represent Standún and taking a rail down Shop Street, for another assignment Clíona and Raymonde were given 30 minutes to put together a window display in a vacant shop in Corbett Court, and a further task seeking to help Clíona develop her networking skills by acting as a guest speaker at a major event.